Dith Pran was a Cambodian journalist who suffered four years of abusive treatment after the Communist Khmer Rouge forces took over his country in 1975. Pran eventually escaped and became a crusader for justice in Cambodia. His story was portrayed in the 1984 movie The Killing Fields. 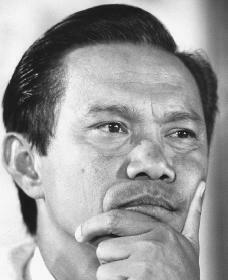 Dith Pran was born on September 27, 1942, in the town of Siem Reap, Cambodia. At that time, the Japanese army occupied Cambodia, which belonged to French Indochina, but Pran's home was far from the center of power. Pran grew up in a middle-class family near the ruins of ancient temples called Angkor Wat with his two sisters and three brothers. His father, Dith Proeung, was a public-works official who supervised the building of roads. Pran attended local schools, where he learned French. He learned English on his own, and after finishing high school in 1960, he went to work as an interpreter (a person who translates from one language into another) for the U.S. Military Assistance Command in Cambodia. After World War II (1939–45) Communist rebels in neighboring Vietnam fought against French attempts to take over their country. (Communists believe in revolution to achieve a society in which the means of production—land, factories, and mines—are owned by the people as a whole rather than by individuals.) The Communists drove the French forces out, gained control over North Vietnam, and began fighting anti-Communist forces in the south, which were supported by the United States. Although Cambodia remained fairly peaceful, Vietnamese troops from both sides began using the country as a place of refuge. In 1965 Cambodia's government ended its relations with the United States, charging that U.S. troops had entered the country's borders to pursue their enemies. Khmer Rouge, or "Red Cambodians," another Communist group. The Khmer Rouge wanted Cambodia to return to farming to meet its citizens' needs and to destroy anything linked to the West. Pran moved his family to Phnom Penh and was hired as a guide and interpreter for New York Times reporters in the area, including Sydney Schanberg, who had come to Phnom Penh in 1972. The two became close friends, and by 1973 Pran worked only with Schanberg. As the war continued, the Khmer Rouge seemed to become stronger. Meanwhile the United States had pulled its troops out of Vietnam, which was then overtaken by Communist forces. In April 1975 American personnel left Phnom Penh as well. Knowing that the Khmer Rouge was about to win, thousands of Cambodians scrambled to escape. Pran helped his wife and their four children escape on a U.S. military truck, but he stayed to help Schanberg report the story of the Khmer Rouge takeover. Both men hoped that with the takeover complete, things would eventually calm down. But the Khmer Rouge soldiers entering the city soon displayed their true intentions. What followed were attacks on shops, looting, and killings. Soldiers opened fire on people in the streets. Many were slaughtered in these first attacks, and many more were killed as almost three million Cambodians were forced out of the city. Pran, Schanberg, and two other reporters went to a hospital to see how many were dead or injured and were met by a group of armed Khmer Rouge soldiers. Pran talked the soldiers out of killing Schanberg and the others, saving their lives. Schanberg soon returned to the United States, where he looked after Pran's wife and children in New York, New York. Pran, meanwhile, was stuck in the new Cambodia, or "Kampuchéa" as the Khmer Rouge had renamed it. He dressed like a peasant and pretended to be a simple villager. It was a wise decision. The Khmer Rouge had orders to execute anyone who wore eyeglasses, perfume, makeup, watches, or other evidence of Western influence. As a symbol of the fact that Cambodia was starting over, 1975 was referred to as "Year Zero." Pran made his way to a village twenty miles from Siem Reap, where he and other villagers were forced to harvest rice while receiving political instruction at night. The workers were allowed to eat just one spoonful of rice per day. Pran and the other starving villagers ate anything they could find: bark, snakes, snails, rats, and even the flesh of dead bodies. One night Pran dared to sneak out to try to eat some raw rice. For this the guards ordered his fellow villagers to beat him and leave him outside in a rainstorm. Nearly two million Cambodians were killed by the Khmer Rouge, but the rest of the world remained silent. Having withdrawn from Southeast Asia, the United States had turned its attention to other issues, and there were few protests of the Khmer Rouge killings. But Sydney Schanberg did not forget. He had received a Pulitzer Prize in 1976 for his Cambodia reporting, and he continued to search for his friend Pran. In January 1979, the Vietnamese invaded Cambodia and finally overthrew the Khmer Rouge. Pran returned to his hometown and found that over fifty members of his family had been killed. Wells were filled with skulls and bones, and the land was covered with graves. Nicknamed "killing fields," these were distinguished from the nearby ground by the fact that the grass was greenest over them. The Vietnamese made Pran a village administrative chief. When a group of Eastern European reporters visited, he managed to get a message to Schanberg through a member of the East German media. But once the Vietnamese learned that Pran had been a reporter, he decided to escape before they could question him. In July 1979 Pran and several others set out on a sixty-mile journey past land mines and the forces of the Vietnamese and Khmer Rouge. He arrived at the Thai border and entered a refugee camp there in October. He asked an American relief officer to contact Schanberg, who met him a week later. Schanberg helped Pran move to the United States, where he was reunited with his family. The New York Times gave him a job as a reporter, and Pran became a U.S. citizen in 1986. Pran began to devote his spare time to helping fellow Cambodians who had suffered under the Khmer Rouge. He took several trips back to Cambodia and attempted to bring the Khmer Rouge to justice before the World Court. He and his wife operate the Dith Pran Holocaust Awareness Project, which maintains a photographic record on the Internet to assist Cambodians in finding missing family members. Pran interviewed twenty-nine people who had suffered during the takeover and published the results in 1997 as Children of Cambodia's Killing Fields: Memoirs by Survivors. For Pran, the ghosts of Cambodia remain, and the memories are "Still alive to me day and night," he said in an online interview at The Site. "It's unbelievable what [the Khmer Rouge] did to the Cambodian people." Pran, Dith. Children of Cambodia's Killing Fields: Memoirs by Survivors. Edited by Kim DePaul. New Haven, CT: Yale University Press, 1997. Schanberg, Sydney H. The Death and Life of Dith Pran. New York: Viking, 1985. Pran passed away on the 30th of March, 2008, yielding to pancreatic cancer.